Chile Chico is situated only 300 miles north of Santiago. Planes from the capital land in La Serena - beautiful seaside resort by the Pacific, three times every day. From here, explore the wild Sierra, the huge Andes and experience a romantic and pure nature moving through canyons, endless plains and over passes of the untouched Andes in close contact to Chilean mountain farmers. There is also time to relax at the Hacienda, having a bath in the crystal clear water of the river. Enjoy hiking on nature trails, or dreaming in the hammock. The blue Pacific with its hidden fishing villages and little mountain settlements in the wild Andes is part of what we encounter in this region as well as lonely valleys and trails in the peace and quiet of the high mountains over which condors fly. A well-known holiday little town to visit is Pisco Elqui in the magical Elqui valley, known for the production of pisco (don't go without trying the famous Chilean pisco sour!). The Rio Hurtado valley is situated nearby, only eight miles to the west; and this is where our trip starts. An Andean adventure tour for you who want to explore nature. Discover the wilderness of Chile during a few days of horse riding trip far away from civilization suiting riders and non-riders alike. Rates include*: Accommodations (suite upgrade available) - two nights at the hacienda and one night camping (or 3 nights hacienda in adverse weather or off season), all your meals, 2 riding days, sleeping bag and inlet, thermal mat, saddle bags, riding gaiters, thermo bottle, all facilities of the hacienda, full access to nature trail and river. Day 1 Transfer from Ovalle, La Serena, or Vicuña. The trip through the mountains to get to our first nights accomodation takes about two hours. On reaching the lodge you can bathe in the river, pick and eat exotic fruit, or relax in a hammock. In our kitchen we only use natural and fresh food to prepare you a delicious dinner. After our meal we sit on the terrace, watching the stars while drinking a glass of Chilean wine and finishing the first day of our trip. Day 3 We continue our trip after breakfast trekking through the high plateaus surrounding the Maiten Sierra and discover extreme contrasts of nature. The sierra shines in various colors due to the minerals present in the rock.You will be fascinated by the green Algarrobo trees, cacti as high as yourself and the calm loneliness. When riding back to the Hacienda, heardsmen with their goats might cross our way. In the evening we will serve dinner in the garden. Day 4 Today is your departure day, but there is still time today to continue your exploration of our little paradise. Swimming, sunbathing, hiking or just relaxing. Our horses are descendants of the Chilean Criollos. They are calm and sweet-natured. Growing up in rocky and difficult areas has made them sure-footed and reliable animals. Those characteristics make them ideal horses for tourists. They are easy to ride and even a skilled rider will enjoy riding them. Our horses are specifically trained for tourist purposes. We use neither spurs nor whips. We use the same paths as the men called Huasos in Chile and Gauchos in Argentina. That's how our horses gain strength and endurance. We find the right horse for every customer. Our herd ranges from calm, easy-going horses for beginners, to the bit more lively ones for experienced riders. Gaucho-saddle with sheep-fur padding, sleeping bag, thermal mat, tent, personal pannier (cup etc. ), ice-box, thermos bottle, by request safety helmet, sombrero head and riding gaiters, first aid kit, saddle bags and finally one of the well trained and calm Chilean mountain horses. Any facilities of the Hacienda such as nature trail and river access. Explorations accompanied by English, German and Spanish speaking guides. The saddles provided are Chilean type, which are called Avios. Its origin is Spanish and they have been designed specially for long trips. Its wooden mount, reinforced with iron, is cushioned with “chiporro” and protected with leather. The other clothing beneath the saddle is called: batán, pellón and matra, and are normally laid on ground by gauchos to provide a soft and warm bed. This is a progressive ride with 2 overnight stays at the Hacienda and 1 night camping. 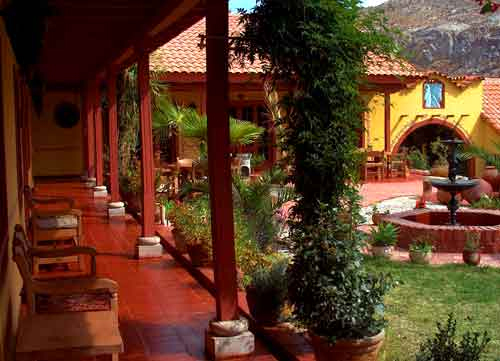 The hacienda also has a beautiful garden where guests can relax. Wi-Fi is available in public areas and is free of charge. Laundry services are available for an extra fee.